In December, streets around the world will light up the city for the holidays and hold various illuminations. The town starts to be colored with various lights and fascinates the people walking by. Every year illuminations with various features are held all over Japan. We will introduce the most popular illumination events held this year. 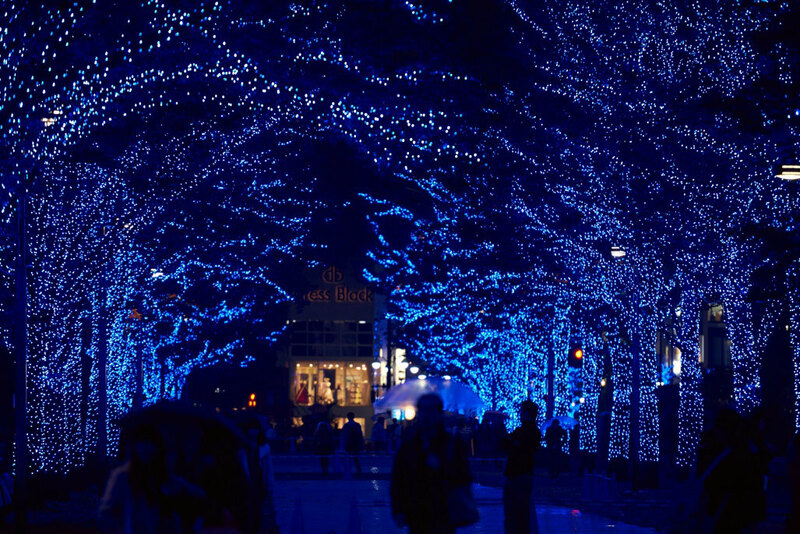 Yoyogi Park will be lit up for a total length of 800 meters and the magnificent Blue Cave represented by the blue-colored light colors the Shibuya winter streets. Several kinds of illumination with special effects effect will also appear. Event Period: November 30-December 31, 2018 17:00～22:00 （The lighting time may depend on the day.）※Please confirm the latest event details with the event organizer or on the official website. This winter, a 27-meter high Christmas tree brightens the Wonder Square of Shin Umeda City. In Germany Christmas Market, you can enjoy German-style Christmas festivities in Japan, including German-style ornaments and candles, sausages and mulled wine. Also, a wooden merry-go-round with about 120 years of history will also be available. During the event, the whole Umeda Sky Building is full of the Christmas spirit. Event Period: November 16-December 25, 2018 17: 00 ~ 22: 30 ※Market is open from 12:00-21:00 (Friday ~ 22:00, Saturdays, Sundays and holidays 11:00-22:00)※Please confirm the latest event details with the event organizer or on the official website. 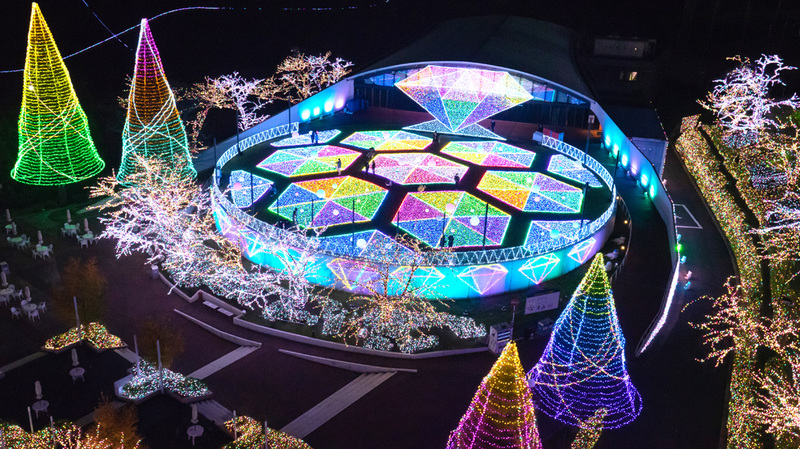 At Ebisu Garden Place, an illumination event is held entitled “Baccarat ETERNAL LIGHTS – Form of Joy.” The world’s largest baccarat chandelier of about 5 meters in height, about 3 meters in width, more than 8000 crystals, and more than 250 lights in total. It also features large Christmas trees on Clock Square, set in the city, lit up with a total of about 100,000 lights. 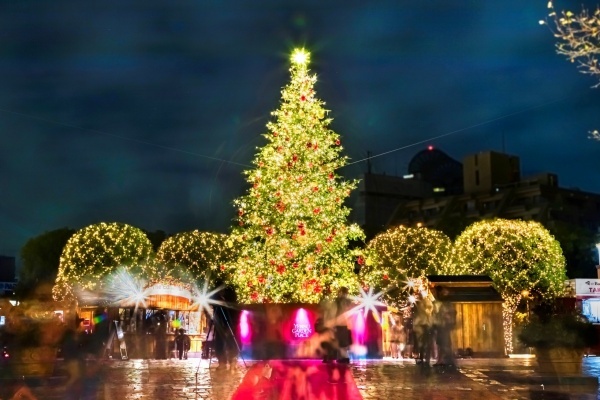 You can enjoy a Christmas unique to Ebisu Garden Place. Event Period: November 3, 2018~January 14, 2019 Chandelier is lit from 11:00~24:00, Christmas illumination is 16:00~24:00 * Open throughout the day※Please confirm the latest event details with the event organizer or on the official website. This year is the 17th anniversary for the Marunouchi Illumination. The illumination covers about 1.2 kilometers of the streets with 1 million original Marunouchi “Champagne Gold” LED lights. This year, the Nijubashi Square has also been added in to the illumination area, and the “Gate of Light” will be open again this year in the Yurakucho area. Event Period: November 8, 2018-17 February 2019 17: 30-23: 00 (17: 00-24: 00 during December)※Please confirm the latest event details with the event organizer or on the official website. Venue: Tokyo-to, Chiyoda-ku Marunouchi Naka-dori, Tokyo Station Area, Otemachi area, etc. Jewellumination is produced by lighting designer Mikiko Ishii. 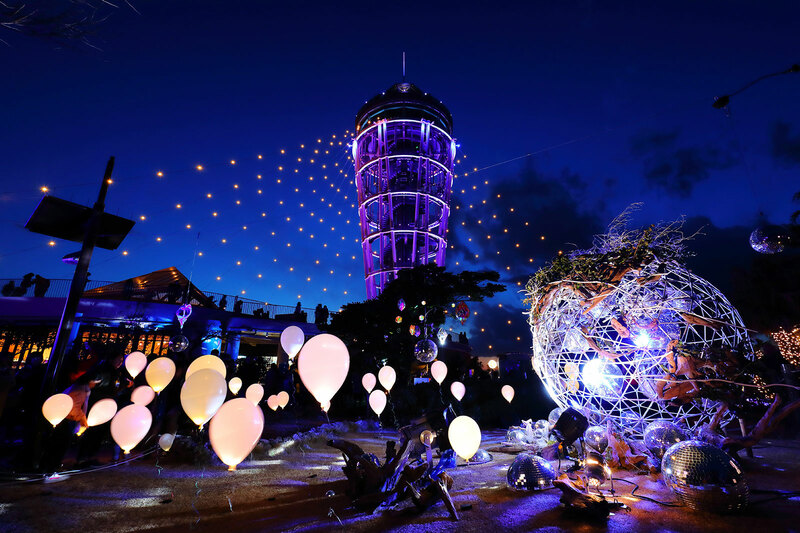 This season we renewed the whole area with the theme of Light Pier as the ideal village of light, the gemstone illumination of 6 million lights. One of the highlights is the 25-meter high Jewelry Mountain. The slopes spread over the mountainside and you can enjoy sledding. In addition to the fountain show using 216 fountains with a width of 60 m and a height of 15 m, you can also enjoy ‘Starlight Bandet’ and ice skating, which runs like a shooting star across the night sky. * Closed January 15-17 and 21-24, 2019※Please confirm the latest event details with the event organizer or on the official website. The main feature of the Osaka Light Symposium 2018 in which the lights are integrated from the city hall around Nakanoshima Park. At the Osaka Municipal Central Public Hall, we celebrate the 100th anniversary of the opening this year. Also in the west side of the Nakanoshima Park Rose Garden, about 1000 lanterns will be put up to celebrate Taiwan’s Lunar New Year (Gen Shosetsu). Nakanoshima Illuminations Street of Zelkova trees with a total length of about 150 meters is synchronized with music and colorful lights. Event Period: December 14-25, 2018 17:00~22:00 (Some programs are from 16:00~)※Please confirm the latest event details with the event organizer or on the official website. Kobe, famous for its night view, remembers victims of the Great Kobe Earthquake and entrusts dreams and hopes for the revival and revitalization of the city since 1995. Since then, it has been supported by many people as an event symbolizing Kobe. The theme is changed every year, and LED light bulbs are used for all works including large works of Luminarie street. Furthermore, in order to continue Kobe Luminarie, please consider to cooperate with the venue donation (100 yen per person). Event Period: December 7-6, 2018 (※For details, please refer to the official website)※Please confirm the latest event details with the event organizer or on the official website. An oasis of llumination at the National Showa Showa Memorial Park in Tokyo. From the Tachikawa area to the plaza, it is wrapped in light. The theme of the illumination changes every year, directing different expressions respectively. Lighting up the large fountain with the symbolic existence of the champagne glass tower using the approximately 15,000 glasses and the symbolic existence of the park, with the canal in the center, the illuminating world where trees and the water surface shine can enjoy the fantastic world. Event Period: December 8-25, 2018 17:00~21:00 (Admission to ~20:50 ※From 16:00 onwards you can only enter from the Tachikawa gate)※Please confirm the latest event details with the event organizer or on the official website. Event Period: November 23, 2018 to February 17, 2019, 17:00 to 20:00※Please confirm the latest event details with the event organizer or on the official website. Venue: Kanagawa Prefecture Fujisawa City Enoshima, Enoshima Sea Candle, Nakatsu Palace Square, etc. Sendai ‘s winter scenes that counts the 33rd time this year. With the theme “Lights on everyone, the light of the heart” with about 600 thousand star-like lights. During the period, there are also booths and ice rinks at Gotokudai Park and Citizen Square. Also, from November 1 to the next February 20 entitled “2018 SENDAI Light Pageant in Izumi Park Town,” the main street in the center area of Izumi Parktown will be colored as the pageant of light. Event Period: December 14-31, 2018 17:30-22:00 (※ Fridays, Saturdays and December 23-24 are ~23:00, and December 31 is ~24:00)※Please confirm the latest event details with the event organizer or on the official website.